Man, did I ever tell you how sooo jealous I am of Dimitri from Paris? The guy is amazing! Dimitri’s made a career out of single-handedly resurrecting old disco tracks and putting them onto hot compilations. I loved Disco Forever, a smooth mix of neglected tracks that I have made part of my permanent rotation. I purchased the CD because of Charanga 76‘s take on “Ain’t No Stopping Us Now”. After listening, I’m also entranced by Pat Lundy‘s powerhouse take on “Work Song”. And the Universal Robot Band‘s “Barely Breaking Even” has become my personal theme song. Plus the album art has genuine early eighties pubic hair! 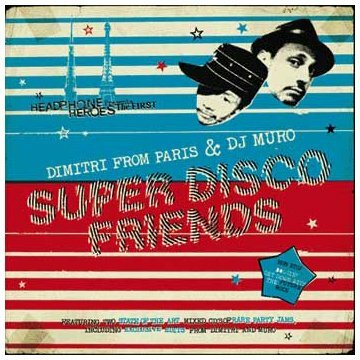 Now Dimitri is back with Super Disco Friends, another wildly successful trip to the treasure vault. The album is a two-disc mix which teams him with Japan’s DJ Muro, and both do an excellent job. Super Disco Friends has a little more rap and electro-disco than did Disco Forever, but it’s still an authentic, luscious record. I don’t know if Dimitri is losing it, though. All the songs are new to me, but I’ve heard of at least four of these bands! Dimitri playing songs by Silver, Platinum, and Gold and War? That’s like Dylan going electric! Snark aside, Super Disco Friends is a me-wantee must-have. It proves Dimitri’s standing as the Ken Burns of Disco. Hey PBS! How about giving Dimitri his own 47-hour miniseries? Time to cut Wynton Marsalis loose…. Hey you folks!!! WAKE UUUUUP! Dimitri is not from Paris, he’s from Istanbul, you know the place dresses up half of EU. Visit Dimitri’s parents on http://www.dimitriisamotherfuckermuslimsonofabitch.com!